During the Summer months my feet require three things: chic (preferably) embellished sandals, fresh pedicures and a great moisturizer. We often neglect our feet in the winter months since they’re mostly hidden behind socks, boots and closed toe shoes. However, summertime calls for a lot of outdoor activities, open-toed shoes, and plenty of opportunities to flaunt your feet. Let the good times roll! To get my feet ready for the summer and to keep them soft and moisturized all throughout the summer months, I am looking forward to trying Tree Hut foot cream and Tree Hut foot scrub. 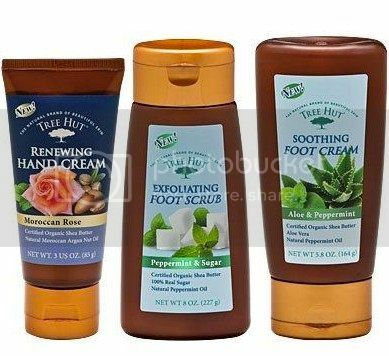 Tree Hut Hand & Foot Care products are developed to keep hands and feet feeling smooth and healthy. Made with certified organic Shea butter and natural oils and extracts, the products make skin smooth and soft. The products also restore the skin’s elasticity and moisturize and repair skin damage. “Bye Bye” to cracked calloused feet! To learn more about the prducts like Tree Hut on Facebook and follow Tree Hut on Twitter You can purchase Tree Hut’s product at Walmart stores nationwide. Here’s to being #naturalbeauty this summer!